Get everything you need from Google, without lifting a finger. 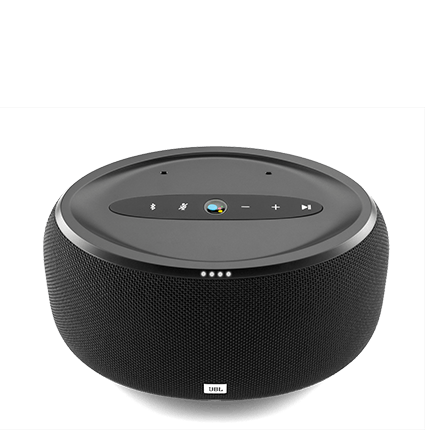 The JBL Link 300 is voice activated, with Google Assistant built in. And you can fill the room with your favourite music from Spotify or Google Play Music. Play your music all around the house and garden. Get help from your Google Assistant. And manage your speakers through the Google Home app. Play the video to find out more about the new JBL Link 20 and Link 300 speakers. Find out the weather forecast before you leave the house. Check sports fixtures for the weekend. Or settle an argument with a quick Google check. All without lifting a finger. The JBL Link 300 is voice activated and has Google Assistant built in, so it's always ready to help. Just say "ok Google" and you'll be able to play your music, control your devices and get answers from Google. And it gets to know you, so the more you use it, the more helpful it gets. The Link 300 isn't just smart. It's powerful too. With its JBL high performance transducers, it'll make your favourite tracks sound better than ever. And if you want to turn up the volume, just connect it to other Chromecast speakers and fill your whole home with music. Want to skip a track or pause the music? No problem. Just talk to the speaker like you normally would. It has far field voice recognition, so it'll still be able to hear you over the music. Set the mood for a dinner party with some laidback tunes. Pump up the volume with a party playlist. Whatever music you're in the mood for, you can stream it straight to your speaker over Bluetooth. That's because it's got Chromecast built in, so you can access services like Spotify, Google Play Music and Pandora. And because Chromecast streams directly from the cloud, you get the highest quality sound. You won't have to spend hours detangling wires and setting up your new JBL Link 300. It's easy to set up and manage your speaker with the free Google Home app, available on iOS and Android. And once you've set up your system, you'll be able to control multi-room playback through the app.